The following particulars should be submitted with admission application form. The ISIS is very conscious about the health of students. ISIS keeps the medical record of each and every student. The Vaccinations, General Examination, Eyes Examination, Ear Examination, Nose Examination, Throat Examination, Chest Examination, Abdominal Examination, Cardiovascular Examination, CNS Examination, Psychiatric Assessment and Dental Examination held with the help of Prominent International Doctors. Affidavit regarding permission for Emergency treatment is also signed from the parents/guardians at the time of admission. The ISF is trying to write off all the fees but due to lack of funds unable to do it right now. Inshallah all the fees, transport, books, uniform etc will be free very soon. 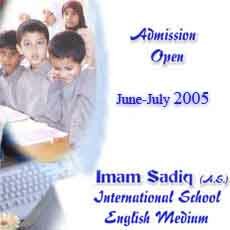 Imam Sadiq (A.S.) International School encourage students by rewarding different scholorships.